Most importantly to us is that we make use of the best qualities of prime material to provide you only the best quality, using no chemicals to obtain the best qualities. Ahimsa silk is a non-violent and eco-friendly process by which silk worms are not killed during the manufacture of silk. The texture and fabric of ahimsa silk are unique — giving it a character of it’s own . The Hindi word “ahimsa” means Non-violence. It is used to describe this innovation because the fabric is manufactured in a process where silkworms are not killed. For this reason , the product is also known as peace silk . 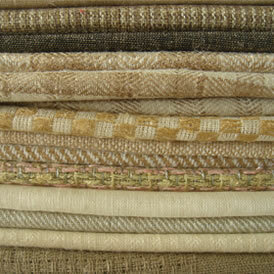 Ahimsa silk is promoted as having the popular properties of regular silk. Even though it is slightly less lustrous, it is even softer to the touch. Our Ahimsa Silks have a characteristic irregular structure obtained by the hand work process. Organic cotton is grown without pesticides, chemical fertilizers or any other chemicals. It is grown using methods and materials that have a low impact on the environment and farm workers. Though organic cotton farming represents a significantly smaller environmental footprint, it cost more to produce. But the benefits against conventional cotton are vast. It gains large benefits on humantiy and our eco-system such as massive saving our precious water, no poluting of environment through toxic exposure, ensuring a healthier working environmental for the farmers and mill workers and providing a healthier, higher-quality product without skin-irritation for the end user. People with allergies and chemical sensitivity especially benefit from organic cotton clothing. Even if you don’t have sensitive skin, organic cotton will just feel better against your skin. Organic cotton has furher the same properties as conventional cotton, it has only an amazing softer touch which is excisted by using no chemicals. 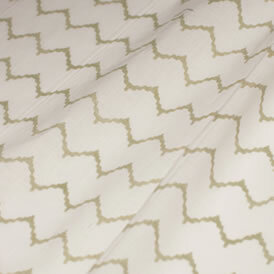 -Solids: machine spun and machine woven solids from organic cotton. -Printed: machine woven organic cotton with naturally dyed prints. 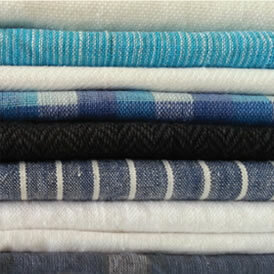 -Jerseys: machine spun and machine knitted jerseys from organic cotton, solids & stripes. 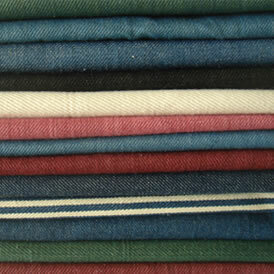 Denim fabric made with 100% organic cotton and free from chemical fertilizers, pesticides and insecticides. The entire production of the fabric adheres strictly to ecological standards: from spinning, dyeing to finishing of the denim. It involves non-toxic fiber processing, colorants and fabric treatments ensuring that no damage was caused to the environment for the production of the fabric. All our organic denims are naturally dyed meaning that the fabric is coloured naturally by using medicinally rich herbs, plant material or minerals & oils. All further threatment before it can be used as fininshed fabric are naturally processes.